Game Informer has posted their NBA 2K19 hands-on impressions. As always, Matt Bertz gives us the goods. He had an opportunity to discuss the game with Mike Wang and OG. Read about the new “Takeover” system, reduced clipping, rebuilt stealing system, one-on-one matchups, unique streetball moves (only available in the Park/Blacktop), shot meter improvements, stronger interior defense, AI enhancements and much more. Cool off to read....seems like 2k is releasing more info earlier than later. The automated contest system has been removed, so defenders need to actively get a hand in the shooter’s face by using the right analog stick if they want to affect the shot. "Visual Concepts brought in streetball players to motion capture new park-specific handling moves like wrapping the ball around the defender’s head and nutmegs....these moves don’t fit the feel of the NBA, so they will be only available in the street modes." Glad it's being limited to street modes and blacktop. Correct me if I'm wrong, but I thought I saw nutmegs during NBA game play while watching video of the "other 2019 game." Lot of good stuff in there. Auto-contest has been in 2K forever and always on by default. Completely removing it is a very significant change...especially for those who relied on just holding LT. Hoping this means Park and NBA games are different feels. That would be awesome. Yes I love that as it brings a bit of skill back. I formed habit way back holding right stick to contest and still used it even though I didn’t have to so it will be easy transition for me. I also loved hearing lightly contested shot after coming off pnr. Assuming that’s those defenders behind me that led to heavily contested shots that drove me crazy! Definitely happy to have live ball back as well! Good stuff here. Reading articles like this is a breath of fresh air compared to how 2K was marketing a few years ago. I'm hoping the new steal system turns out to be a positive move. The art of the steal has felt really random and unrewarding for me in 2K18. After my hand swiped through the middle of the basketball enough times (with no collision detected or loose ball inducted), I found my best chance of poking the ball away against the computer was just to stand upright as close to the ball handler as possible. It'd be nice to see a return to something a little more sensible there. The takeover system would be cool in myleague and mygm. It definitely happens in real life where some guys go off. I feel like it’ll get annoying online though. I knew that was the case, thats my problem with alot of 2k's programming, just quickly throwing together a weak fix on a huge issue. lastly am really looking forward to see what has been improved with the post game..knowing how "hand down man down" is finally more accurate to reflect contested shots penalties , and the better collisions ...am super excited .. I forget which 2k but they used to have all the those streetball moves during street games. They are just bringing something back that was there in the past. Good read!! Definitely intrigued by the new takeover system. Damn, I wish Rebounding was one of the "8" big things. One youtuber stated that it looks like rebounding wasn't touched. Some really pointed, specific things they focused on, that we're hearing about early in the game has me intrigued. As always, love Mike's candidness. I figured the clipping issues were a result of the new motion system- should make a lot of folks happy its been focused on. So now they come out and tell us why we saw so many missed layups? We often hear about the bugs in a previous game when the marketing begins for the next game. stronger interior defense is all i had to read to get excited. i hope elite defenders are a lot quicker to rotate when there's a drive. transition improvements as well, nice. From my time, I honestly didn't notice it like I did with 18 which stood out right away at that time. The new body up system is definitely a welcome addition. Soooo the grand badge now has a meter? So glad to hear dude. This entire article has me excited, on top of the fact that Czar let me know my warping issue has been fixed by Jers. If they can continue on this path of fixing these small issues, that all add up in a big way, watch out. I'm looking forward to it. Agreed. I don't know the feature list though so im curious what they have on that front. Yeah, or even when talking about DLC for the same game. That's what happened with Sonic Mania--which is a GREAT game, don't get me wrong, but it's even better with the Plus update, because they were able to fix everything they missed. And that's enough of me going off-topic. Everything sounded good except for the return of grand badges. Sharpshooters were OP enough as it is and now we get to deal with hall of fame badges and a grand badge to go along with it. We'll see how this turns out. One of the things about 2K, and I guess it can't be helped because of their PR/social media protocols, is that their "in season" transparency is very low. We never here about the problems that a new system causes or a major bug find until the information about the next version of the game releases. Hearing about it during the year might alleviate some of the frustration that people have with the game they're currently playing, but with the extremely toxicity the game now faces on social media, I guess I understand why they don't share more about the problems they are having during a game cycle. Here’s a question about ‘improved AI’: Does the AI actually STEP UP AND DEFEND/CONTEST LIMITLESS RANGE SHOTS? It’s really damn annoying watching players completely exploit the fact that the AI never played defense that far out. They had me at reduced clipping! This is the protocol for every yearly sporting release. Not saying its right or wrong, but that's how they operate. We know from Czar that some things can't be simply patched out; it requires the base game to be changed. I like what I read. I always prefer the defensive side of the ball, so it is good to here defense got some attention. Glad to see auto contest out. I don't like getting pulled out of position due to animations. So hopefully stick skills matter like it said in article. Hopefully stealing is better as advertised. It was frustrating in 18 having a player with high steal rating and it being pointless. Hopefully with less clipping, it leads to improved ball security. It was frustrating turning the ball over frequently by cpu making contact. I'm wait and see when it comes to improved AI. It would make playing against CPU more fun and realistic if they actually make adjustments. With a game our size every year every issue can't have a full solution. It is literally impossible to do that in an 8 month dev period. We delivered an entirely new motion system and a new experience called the neighborhood in that same time period. So I think your comment lacks a little perspective. Making a video game is all about the decisions you have to make to deliver the product on time. Every yearly released game has to make these decisions. But few deliver as much content as we do on a yearly basis. everyone on our team busts their behind to do everything they can in that time period to make the game as good as it can be. The results may not always reflect that but it is what it is. That's where you see people stopping the blow by. It's in there. Has anything been said about the court colors being way to dull? It's definitely much harder than you think it is and mind you Mike Wang has explained how they tackle chunks of the game at a time. More than anything you can usually trust the devs to eventually hit that stuff if it doesn't take too much away from their forward progress. We all have our gripes...but if you knew how they pounded away on so many things it's mind boggling. I think when you ask for removal of 2 man animations and some are removed you get what we saw in 18. Seems as though this year they put a fresh batch of fix on it this time around and that's great for sure. Enjoyed just reading about how the major clipping issues have been cleaned up now that they've had another full dev cycle with the new motion system etc. It's nice when a new system gets another year to just be "cleaned up" and you get a polished up product. Also keen to see/feel how the one on one aspect plays out. All good stuff here for me. Sounds great but not gonna believe until I get the chance to try it myself. Last year got promised through the blog that the defense is improved, smarter etc. but it was really bad in 2k18. It's great if they managed to fix all the both bigger and smaller problems from the last year but that's something I have to check on my own. Also about the blow by and layups, when I and other people complained about that stuff I've been told that people like me are the reason why there was a brick wall defense and that it's better how it was in 2k18 but now all of a sudden everybody including devs admit that it is a problem that had to be fixed. Same thing with the layups. I am honestly not liking the sound of a takeover system. I felt you could takeover on this game already just naturally and being hot. Hope it’s nothing like Grand badges. First thing I thought about when I heard it was the warriors lol, 3rd quarter run. I didn't notice anything overpowered though. Had a chance to get the icon under Paul Milsap using the Nuggets. ..and one other plans but he wasn't all of a sudden Karl Malone. I did a spin from the post to score which wasn't a move I could pull off every time or anything but I likely got it due to him having the icon present. What I really want back or something similar is 2Ks momentum meter from college hoops2k. This might be something similar on a smaller level. Very interesting - I was curious about this and sat on the fence thinking it was one of those "see for myself" things. I anticipated it was something that was sort of already under the hood, but maybe more accentuated this year? Yeah to fully get a grasp we have to wait to see their thinking behind it's implementation, but I never saw anything wild and crazy. LeBron could've been a different story but I didn't use him. Clever marketing 2k...Acknowledge the clipping problems the game had for a full year when you promote the new game and promise its fixed. That's not marketing that's something they needed to address with the new motion system. Gotta wait and see about take over before pronouncing death around it. Even if it was ok bet it's something they could tweak, but didn't the article say call timeout to expedite them cooling off? That’s good to hear. I think it being named “Takeover” is what made me nervous. So hopefully its nothing arcadey like Grand Badges were. Yep - and let's face it, that's what is done in real basketball too. Implementing something like this is always gonna cause concerns or a degree of skepticism, but if done correctly, we'll probably just take it all in stride (if you stay true to the game of basketball). As a rough example, I don't take note of or look at player badges at all. I understand why they're there, but based on what I know about NBA basketball, I go in and just play. The rest takes care of itself. I understand why they're in there though. Yep same, in fact when I heard about them (I believe it was 2K13), I thought it was quite an innovative way of adding a layer to player ratings to create a bit more separation between certain players. Hard to disagree with you on them being a big time MyPlayer feature now though haha. 2k is getting it right, nice! Stronger Interior defense. What I'd like to see is in conjunction with the "layup bandaid" If you delve into stats, most guys aren't hitting 60% of their inside shots. Elite finishers do that. What they need is to make the misses based on proximity of the defender to the offensive player and based on size and attributes. Missing layups was arbitrary often last year. That should change but at the same time we don't need to be making 80% of our shots when a smaller player drives the lane against interior D. I hope this includes stronger post D as well. Rebuilt stealing system. This sounds great for both the user controlled player and if it's implemented well for your AI teammates. Punish players for being loose with the ball. Punish them for lazy passes. Carelessness. Drastically reduced clipping. This sounds great. I want to see the bumping. I want to see guys get knocked slightly off stride (within reason, no return to a couple years ago when your player got hooked on the screener and moved 5 to 10 feet on the court). Streetball moves: Don't play these modes. More emphasis on stick skills. I get how this popular and especially big with online play. But as a franchise guy looking for sim I don't want my stick skills to be so important that I can turn Luke Kennard into Klay Thompson or Stanley Johnson into Lebron. Like with everything we have to wait and see implementation but I worry about a loss of realism if stick skills override attributes too much. Takeover system: Doesn't sound like much fun for franchise mode. There already seemed to be a momentum system in past games where myself or the AI team made runs. I get the concept but I'm wary of it dominating the game. I'm also uncomfortable with players unlocking new animations. Being hot doesn't make you suddenly learn to do new moves. It should impact your shooting with a hand in your face, contact shots, etc. I know it's a small thing so it might be in the game but work on the transition game is the number one thing for me. I get tired of Boban running down a guard or watching my wing go to cut off transition then for no reason veer to the scorer's table, leading to any easy transition basket. This never belonged into the game, I'am glad they finally took it out. Really don't like the sound of that take over bs. I mean, I just scored 53 in a walk on pro am game so I def don't need any more artificial boosts than are already there with hall of fame badges and and buying skill boosts. This to me just sounds as if it will breed selfishness for online play which already rewards a lot of selfish basketball. Yeah, I'm not too sure about the takeover feature either. I just don't feel like there's a mechanic that can accurately capture the organic nature of getting hot or going on runs. It may be placebo but I always felt like the old 2K games played better once I turned off clutch factor and 6th man advantage/momentum (College Hoops). I'll give it a shot but if it's OP it be nice to have the option to disable it. I agree with a lot of this. Good post! I’m also not a fan of players unlocking new animations that irl they can’t do. Cheese! Oh man I’m so with you on transition and fast breaks or getting into a secondary offense. It’s badly needed! Having guys cross cross in front of me was horrible! I wonder if the evolved body and contact system will allow for a more realistic differentiation between more and less athletic players. 2K has struggled to keep up with the NBA in terms of the advantages of small lineups who can thrive in transition or use athleticism to exploit space and mismatches against defenders. One of the things I heard Books point out in a simhangout and Czar agreed is that, effectively, the court in 2k feels smaller, and the reason is that player bodies take up more space in the court than their actual dimensions warrant. By that I mean, while the bodies are to scale with the court, there's this function where when a player or the ball gets within a certain distance of a body, an animation triggers. That means there's less space between bodies that is actually "free" space on the court. That makes the court feel smaller. As a result, that diminished amount of space for player movement means that more athletic, maybe smaller players have less room in 2k to make use of the actual advantages they can have in the real NBA. So I'm wondering if this improved player contact system will address that. The flip side of this is that bigger guys should be more effective down low for rebounds and layups than they have been in 2k18. The feedback from Smoove and Mazique about how rebounds still seem to be off key with player size and positioning makes me think that maybe true player by player physical attributes will still be a bit diminshed by the limitations of game mechanics. I'm sure this is not an easy thing to address in coding. I'm just curious to see if this improves or not. Collission system didnt mention people's bodies being ignored and slid out the way like I saw curry do in one of the gameplays. I saw an older video from nba live 16 where Kobe went to dunk in his own animation, Pat Beverly went to block in his own animation, and they collided in the air in a non canned physics based interaction. I dunno why they want to fix defense, especially interior defense. Other than a few overpowered offensive animations and builds (SHARPS), defense is alright. They are actual doing defense focused players a disservice by buffing defense, and we don't need any more steals inside. Holy crap. Here is my take on defense, once again. The problem with defense in 2k18 is not that you can't play it but that a pure defender, or even defender-primary is so garbage (save for a few builds) that they cannot score. A pure sharp can stop a pure defender from scoring. In L*ve, people make lay ups unless you stop them, so a pure defender has more value... you can stop their lay ups, but their shooter archetype cannot stop yours. Stretch bigs in general, in my opinion, are much less OP in L*ve because of this. It seems backwards, but that's how you 'fix defense', you make it so that people have to play defense to stop you. Then the people who play defense will be successful and the people who don't won't, and if you have a team of pure defenders that knows offense and they play vs a team of pure shooters that doesn't know defense, they win. That is not gonna happen in 2k, currently. Contesting inside is fine, save for some posters and dudes setting picks to get position, but you can stand in front of them and steal the pass. Just make a /defender. As a big, that makes huge difference in terms of stopping people inside. If you make interior stronger, that gives people more incentive to roll pure stretches... you know that right? When most people already have pure stretches. I do not agree with this in all aspects. The probably I have (having 2 two ways, and a pure lockdown) is that defensive badges and attributes do not effect individuals the same as offensive ones do. I've had a right stick hand in the face of someone with HOF defensive stopper and watched a heavily (if not smothered) contested shot drop on me. My two way Athletic consistently gets killed in the paint because I'm not 7'3 340, and my Rebounding Defender also allows entirely too many contested shots to drop. This year it legitimately feels like there is little to no reason to having defense in your build other than a speed bump. u may play online only (that's the jist of what i take away from your post), but interior defense from an offline sim standpoint needs work - it's super obvious. Holding the left bumper button, you can check where all your players on the court are at in terms of activating their Takeover. Multiple players on the same team can activate Takeovers at the same time, as well, making for some intriguing combinations. The idea of players being able to play a little better and unlocking better animations when hot actually sounds okay to me. Especially it's done in a way that makes sense like described in the article. But hitting the bumper to check Takeover status sounds like some complete video game nonsense to me. I don't feel like that's something we should be able to get a precise gauge of. Also, in terms of its activation, I'd like a little bit of clarity on that. Is it automatically done once you're hot or is it performed with a button press? If it's the latter that would be extremely disappointing. And I'm not sure how easy it will be for all 5 guys but I only saw two at once in a game at most. And I wasnt doing crazy burn the house down blow out scoring. I agree. I feel like when a player is "hot" it should happen naturally throughout the game and there shouldn't be a indicator that tells you exactly when a player is "hot". It make the game feel acradey. I hope it is nothing like grand badges in 2k17 and takeover is just another word for a player being on fire. It would be nice if you could turn it off for your league or even a single game. I don't like being FORCED into something like this. But if I have the OPTION, I'm all for it. I'm seeing a lot of comments like this in this thread, like hot and cold is something new. The concept of hot and cold statuses for players that temporarily buff or nerf and having indicator icons for them have been in the series for generations now. It's all tied to the Consistency ratings. The difference here with Takeover is you can manually activate additional animations/abilities when a hot streak happens, kind of like ultimates in Overwatch. Personally, I agree that I find this addition to be a bit "game"-y (a negative connotation amongst game developers meaning it breaks immersion), so I hope it is only confined to competitive online modes where it makes a bit more sense. Hopefully, the feature stays far, far, far away from MyLeague as this is not the way that runs and streaks work in reality, players don't just "activate" themselves like super saiyan because they made a couple shots. No mentioning of pick and roll cpu defense and moving screens. Both need to be fixed. Moving screens are never called thus making the pick and roll stronger and more reliable than it has to be. And the cpu pick and roll defense is just terrible for today's standard of basketball game. I hope both are going to be improved if not fixed completely. I think that will be addressed whenever ScottG decides to release his blog. FYI, I see at least two "Illegal Pick" calls made against the AI every 48 minute game, but I use custom sliders with the fouls cranked all the way up. Now that I think about it though, it's mostly called during off-ball screens. Yeah, having "ults" in a nba game would be absurd. Considering that 2k is trying to be more competitive and sim for their 2KLeague this doesn't help. From reading the article I wasn't impressed with the new takeover system. Although, I'm optimistic that the devs know how to balance this new feature and it won't be OP like everyone is thinking it will be. Another thing like alot of people already commented is unlocking new animations when the meter is full. This feature make no sense at all in an nba game. Again, this make the game feel arcadey. We can already unlock new animations with hall of fame badges and in my opinion there no need for this. ...players don't just "activate" themselves like super saiyan because they made a couple shots. Whereas from strategy standpoint it could be interesting to time these "hot" periods as a team in a ProAM scenario, it has nothing to do with actual basketball. I agree 100%. The more I thought about it, I just don’t believe 2K will get this right. We’ll have to see once the game is out for everyone and people have their MyPlayers all souped up and people just learn the game in general. Just have a feeling in the end, it’ll be a lot more complaints about this feature. Hopefully, I am wrong but I just can’t see this being a welcomed feature. This is the only thing I don't like about the system it leads to cheese and abuse this "Pyschic Friends" aspect of it needs to be eliminated immediately. "Holding the left bumper button, you can check where all your players on the court are at in terms of activating their Takeover." This is a hideous approach and needs to be shut down, the end-user will force the momentum, instead of it activating naturally within the flow of the game. This just leads to abuse in my opinion. I agree completely. I can't wait to see that little fire (if that's how they indicate it, and I hope it is for nostalgia purposes), and trying to figure out how in the heck to stop them. A real game changer would be the ability for you and the CPU to draw charges in the paint. That hasn't been in the game for at least 5 years. I've only been able to do it 4 times in 2k18 and maybe once in 17. Imagine instead of your CPU teammates reaching and gifting the other team FTs, someone steps forward and draws a charge. I'd much rather see the CPU get a blocking foul than see them clothesline or swat the arms of every player that comes into the paint. Man, you’re right. I haven’t even noticed it but I honestly don’t believe I’ve seen a charge in the paint where a defender steps in and takes the contact especially not the CPU AI. Meh, we'll see. I feel like 2k throws the "completely rebuilt" phrase around every year, then the game comes out and we're all left wondering wtf they were talking about. As of now I'm still leaning towards that $40 Live preorder. Man, as an offline gamer, I hope 2K19 does anything but mimic 2K17's computer defense. That game was an awful experience for me. It seemed like basketball moves didn't matter one bit. Defenses never bit on pumpfakes (nary a shift in body weight, even), jab steps were rendered meaningless, and attacking any kind of natural basketball opening often resulted in defenders magical shifting their weight and momentum so they could cement their feet in front of the opposition without ceding any headway. If you're talking about human vs. human defense, then forget I ever said anything. I cannot speak on that. Every year same interviews hyping the game up about the changes and no cheese. I remember ld2k saying no more cheese on a livestream. And this interview they admit they ****ed up many aspects of 2k18 and the bugs and clipping. I love playing online, and these kast couple years have been terrible. everyone online plays the same way. This was the only year I gave away 2k in May after a game online. Using the raptors and deroezan posterized LeBron in back to back plays. I just gave up because I didn't want a arcade experiencw. Like damn deroezan dunks like 10 times a year and in 2k he's posterizing everyone. I hope so, because it reads like pull the trigger and see where your teammates are at on the "takeover meter" and someone seeing who to feed based on a meter just doesn't sound right to me, it takes away from the natural flow of the eye test the old "I can see Bron was getting it going so I feed him" There is no meter involved. Not one person has reported any cheese or abuse through it yet so why are y'all so worried? Even the article says you can call timeout to cool the opponent down. You still have to get off good shots to make shots regardless. Interesting article, lots of nice little things but the main issues with the game -- ludicrous micro-transactions, terrible servers, and one of the poorer 2K rollouts in recent history -- still loom large. If the gameplay is better, that's great, but just because it's better at release doesn't mean it will stay that way. 2K has been very bad at releasing patch after patch (and releasing little to no notes for them), altering the gameplay from month to month. It's easy to get sucked into the hype machine. I'm out this year -- September is for Spider-Man. There are bigger issues they need to address and I doubt they actually will in any meaningful way. There is alot of assuming going on where we need to hear from the ones who put it in. I wish they would have mentioned the "cpu never calling time outs" bugs were addressed. I hope it was. That was a serious issues for me. Mike Wang in the Game Informer article explained how it works. Yeah, until they address the fact that you have to pay nearly an EXTRA $100 just to have a decent rating, I'm out. Pardon us for "whining" about something that is described more like a video game element than a basketball one. Not all of us have access to the game is the stage. All we're able to do is comment on and ask questions about what we're provided with. I'll wait for the game. But it does sound nice. Yea I play offline too but this year season mode was bugged. Those 2 billion dollar contracts and weird progression/regression system was also bugged. Didnt understand how Embiid was already regressing after one season and I am not gonna go edit every player ratings. This version just wasn't that great for me. Nah it's definitely turning into a group thing. It's still July but again, did you see guys like Shakedown, or Chris Smoove who was looking for exploits, or me, or Brian Mazique or even the videogamey YouTubers mention this even once? There must be a reason right? Do you know if they fixed the block spamming. In 2k18 it was crazy guys would spam blocks and get rewarded for blocks with their elbow on the way down. Hopefully this gets addressed because it should be instant points when your big gets the ball and they start spamming steals and blocks. wait, what was the workaround? Sliders? I played another game last night, CPU called 2 time outs the whole game. I don't keep up with the Youtube or 2K personalities like that to know who values simulation aspects of basketball. And because of that, I wouldn't put much value in those opinions anyway. I can't speak for the rest of the thread or whoever else may have commented on the Takeover. All I said was that everything else sounded good, but this particular snippet wasn't appealing to me at all. It could very well be nothing to worry about once I see more and play the game, but I don't feel it as its described in the article. Is this the build that will be played mid feb? Probably not after all the patches. The takeover mechanism sounds a little gimmicky in my opinion. I don't like 2K adding meters and emphasis on things that always seemed so organic in the past. I wish they would do away with the shot meters as well. We never needed them in the past iterations of the game, and since they've been added, I find myself trying to read the meter more than actually paying attention to the players animation, which used to dictate success moreso than meter spamming. Point of my mentioning YouTubers is because most of them are cheese balls and they would definitely be hyped over something giving them an advantage. "Bootleg bring down the house meter"
Say what you want about the YT'ers, at least they are approaching this with intention on actually enjoying the game and making it better...even if misguided in certain aspects. This is much better than this toxic, agenda driven, everything is broken beyond repair before we even play type approach. Many of them actually stressed tested some of the issues from last year to see if they were fixed and gave good feedback if you watched their videos. That said, I 100% understand the skepticism of the take over mode, I dont think it'll go without further explanation though. If done well, I think it could be a really nice addition. Looking forward to hearing Mike expand on it. a couple of YouTubers compared the takeover system to grand badges in 2k17. People who don’t play mycareer may not be familiar with that feature. Sample size is way too small. There is no way playing a handful of 6 minute games with 2 teams and add to that how easy it is to being awed into how new the game is and noticing all the other improvements that you would be seeing, it would be so hard to notice it anyways. Plus a lot of guys (I’d say 99.9% sim or not) wouldn’t even realize it if they saw it anyways. Guys like Steph Curry or Klay Thompson doing a spin layup as they think wow that was sick, but they dont even do it irl 99.9% of time (I put that because someone will try and dig one out of nowhere lol). Mario hezonja isn’t a stepback shooter, but if you saw him do that in the game would you think that? Or Jarrett Allen using a spin move in the post. For me personally I’m strictly talking about under the hood and unlocking animations or badges. Question for you... Do you know if a player has no badge and gets hot that they level up to a bronze badge in a specific area? Does it strictly just apply to badges they already have? They said it’s tied to an archetype. I don’t think it really effects online or my player modes as it’s more hot and cold. I’m strictly talking about cpu players and offline. Never played my career and not familiar with it. I have heard them say that. For clarification can you break it down. I’m assuming it is What I think it is? It all depends how you look at it. When it comes to the take over feature I'm optimistic. For features like this my first thought is "does it makes sense, is it realistic in theory?" I say yes. Players can dictate games in different ways and there should be a feature that allows players to impact a game without needing to be "on fire" in terms of scoring. I think this could add a lot of value to players that are known for things outside of scoring. If done right players like Draymond Green and Rudy Gobert could be monsters in certain games. I understand the skepticism, and the feature probably won't be perfect in it's first year being implemented, but I think it could add a lot in the long run it done right. People were once concerned about badges and how it would effect games but I couldn't imagine the game without badges now. I can see the take over mode being similar. I agree it’s got potential and a place for sure. Thinking about the guys you mentioned with Gobert, draymond, Rondo, etc and them taking over a game like they do in their own ways could be awesome! The take over thing seems like something we had before.Guys get on fire for a few plays currently. I don't see how this changes much in regards to the current form. I hope it’s not but I felt those types of vibes from how it was described. I am not looking forward to anything similar to Grand Badges. It’s a lot of things that isn’t caught when guys are playing these games at this time. Once the game is actually released is when you’ll really be able to tell. I believe being able to tell a player was getting “hot” was fine how it’s been. A meter showing when someone is in “Takeover” mode seems like a little much. My guess is it’ll be removed for 2K20. I can try and give you an example. Say my MyPlayer is a Playmaker type of build. 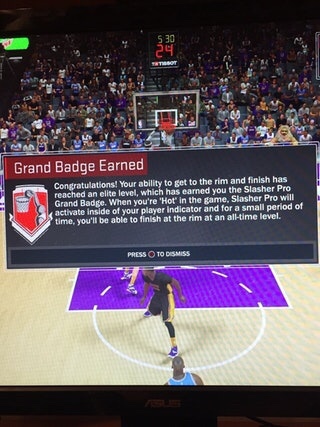 If I make a few shots or get a few steals, my Grand Badge will activate and a big red icon will appear under your players feet. Me being a Playmaker, I will be able to break ankles a lot easier. Players that are Sharp Shooters can make almost anything and so on. It was just a bad experience and overkill as it pertains to badges. Sure man . The grand badge activated when your player got EXTREMELY hot . Depending on your specialty you received a boost . For example playmakers had a much higher chance of getting ankle breakers and successful passes. If a playmaker had this activated their ball control was tip top. Rebounders - were automatic on the glass . Nearly impossible to box out . Think of those guys that can grab 20 rebounds. Shot creators - just had higher success of hitting tough/contested shots. Lockdown defenders - my specialty . When this activated I was almost guaranteed a sick block or cold blooded strip on my opponent . Think Kawhi on defense. Now to activate the grand badge a player had to get hot in their key skills. Playmakers have to get assists. Rebounders have to get boards especially offensive . Lockdown defenders have to get good shot contest or force turnover . Sharpshooters have to make jumpers . The one feature that also got me thinking is coming with the layup meter. Last time they released. Everyone hated it. Because users were missing open layups. Or layups they thought should go in. This sounds like an evolution of that system. I always thought the hot and cold streaks were strictly about scoring in past games, maybe I'm mistaken. I think there was a system in place that was similar to the take over feauture but it was more under the hood type stuff that wasn't translated well to the players. The new take over system seems to be more up front about how a player can get hot and cold and what the effects are. That sounds pretty dope tbh...especially with how its activated. Was it OP in execution? I believe 2K said that in the beginning but it wasn’t necessarily true. All you had to do was basically do good things on the floor. 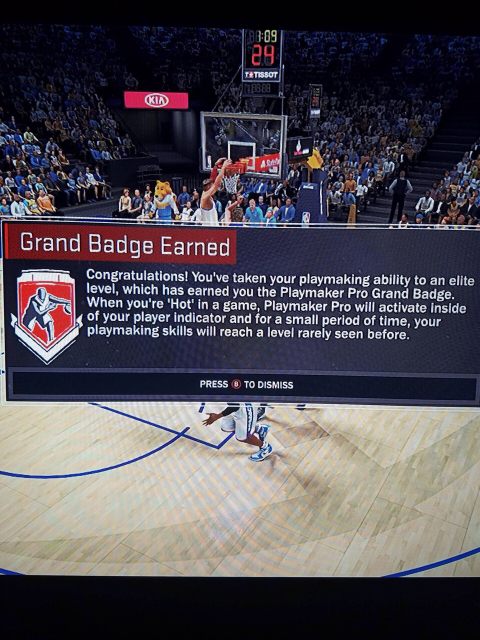 You could activate a Playmakers Grand Badge from getting a block, steal or anything. Just getting hot. From what I remember....yeah it was OP....guys would just shoot at the corner and drain threes all day long. It got boring when EVERYONE had the same playstyle. Offline though it was fun locking down the middle. Online was no fun at all. Hell yeah it was op lol . But it was fun and IMO gave 2k17 pro am so much more “flavor” compared to nba 2k18 pro am. It needed to be toned down . But the idea was good. It was too common for all 5 guys to be that hot. I see it adding character to 1 V 1 modes. Taking over with Bron or Kobe should be classic . Help separate superstars . My only nervousness stems from the new steal system, particularly when they mentioned it being easier to get steals when bringing a perimeter defender down to double the post. In my opinion, it has been far too easy to steal the ball in the post in the past, especially when to post player makes the right read to kick out to the perimeter shooter or the perimeter player making a pinch post cut. I'm really hoping this doesn't rear its head as an issue with the new stealing system. It was large enough for me to see 2 people on my team get it but without me being told I had no idea what it was, all I noticed was a new "hot" icon. Not like Paul Milsap all of a sudden turned into Karl Malone lol. I watched the videos and I watched them stress test to see if the blow by cheese is still there. The issue with stress testing is whatever build they played right now will be patched several times. The 2 times I got a recent 2k on release I didnt have a problem with movement on release. They movement since 2k17 always undergoes multiple patches until once again people start saying dribbling is sluggish and we start seeing more warping. The point still stands that I have never since 2k14 seen a negative review from these early hands on players, yet Mid Feb or March some of the same people who had high praise have not kept the same energy. Thats not because they are lying. Its because the game gets patched and things get buffed and nerfed until its not the same game anymore. So when people point out improvements, if they seem like they could be adjusted with a slider like shot success or defenders stickeness on the ballhandler, it will likely be diff by feb. It was really OP, and it was presented the same way as this takeover thing is being presented now, hence all the doubts people are having. It didn't activate thanks to archetype specific actions, it was just a super-hot level you got to. You didn't even need to do much, my lockdown grand badge activated a million times just by celebrating after a teammate scored on a possession where I didn't touch the ball, just because I had the expressive badge; once I left the left stick pointing up to not get kicked while I went to answer the door and it activated while my player was running out of bounds far from the action (teammates saved the clip and showed it to me). And it didn't only boost your archetypes specialty, every rating went up. Pair that with the fact that shooting was ridiculously easy in 2K17 and you got every lockdown with a 60 base st3 easily shooting 60+%. So, yeah, I get why some may get a weird vibe from the takeover system. I think it's not going to be as bad for team controlling modes, and just hope it's pretty hard to get and not as game breaking for ProAm. So far I like all the info that has come out. Lol yup. And I'm sure it'll be the same with blowby nerfing. People are gonna be pissed because they can't just dribble by a guy in a 1v1 90% of the time like last year. Well... this isn't defense on 2k side. But out of the box 2k18. The hip animation wasn't a thing. The most that would happen is the user would miss. But then they released patch 1... And everything changed from that day. I think we're probably going to see a change. I like the idea of the layup meter. But this is a video game. People missing wide open or slight contest layups will kill someone. Nah I was talking about CPU defense. It was pretty tough, not saying it was reasonable but they then fixed it by making it so easy to just blow by defenders. I skipped 2K18 because of the transaction-a-palooza the game was. Even if the gameplay has improved a lot, unless the transactions are tamped down, I hesitate on going in this year as well. Does anyone else feel the same way? I'm ok with being "hot" giving you new animations, it kind of happens in real life when the finale of the player's hot streak tends to have a total "wow" moment. Takeover system ? Game is on pace to become an arcade game with full speed !!!! Does it replace being "hot"? As in, if you're a pure sharp and on fire, you can just pull up and hit 3 after 3 from 30 deep. And you can stay on fire as long as you're hitting. Maybe this will kind of make you hot for less time? Also, did we get anything about rebounding or screens? A lot of what made shooters so OP was the constant screen spamming and rebounders jumping out of position for offensive boards. First of all, it's still heavily debated whether the idea of a hot hand even exists. But that's not what we're talking about here. Do players suddenly have the ability to pull off moves they could never pull off earlier in the same game, in real life? And are they able to trigger it off some kind of internal switch? No, of course not, that's ridiculous, the stuff of movies. I hope stepbacks and all that are actually useful in 2k19. So far I feel like they're just in for aesthetic purposes. If you are able to create space, you should be rewarded. It's so frustrating to see defenses slide and warp their way to get back in front of the ball handler. I'm tired of having to play like the Rockets every game. Let mid-range creators play like mid-range creators. Considering everyone that played early spoke on improved defense and a sim experience, The 'takeover' could be cool in play now with scattered HOF badges and reasonable ratings. Now in the hands of pure players with 95+ ratings, and HOF badges? May gawd have mercy on our souls. Yh Idk how to exactly feel about the takeover system. It sounds like a nice change of pace but at the same time, sounds like something that could definitely be exploited and tarnish the games realism. So uhhh... are we addressing what Beluba said on Twitter about the takeover system or... ? It just seems like they tweaked the hot/cold system that's already in the game and add badges to the mix. Don't know how I feel about doing new animations tho. It also seems like they can tune it so if it's too impactful it can be scaled back.